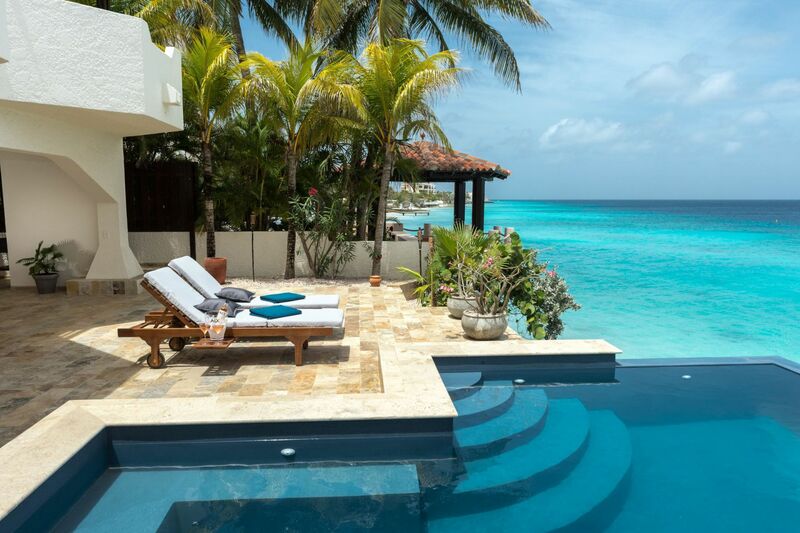 This is the ultimate beachvilla on Bonaire. The villa has an open lay out (perfectly positioned to catch cross breezes) in which the living room, dining room and kitchen, located at upper floorlevel, seamlessly flow into each other. The living room is a spacious "covered terrace" with mind blowing views over the Caribbean Sea. The view from the kitchen and the dining area matches the most beautiful painting by French artist Monet. From the living room easy stairs leading down to the sun terrace with lounge pool, outdoor shower and access to the crystal clear Caribbean Sea. The seaside gazebo offers a great place to relax and read a good book or to have a nice drink with family/friends and enjoy life. Also located at upper floor, the guest studio with separate stairs, kitchenette, bedroom and bathroom provides just that bit of privacy you and your guest need. At lower floor, there are the master wing and two guest bedrooms, all with en suite bathrooms. The garage with remote operated door has ample space for two cars, your motorbike and watersport gear. There is also sufficient off-street parking, both in front and behind a locked gate. 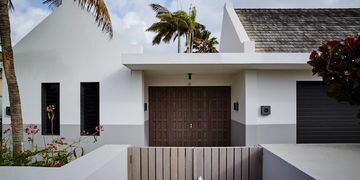 Kas Bonchi is designed by Dutch top architect Piet Boon® and is the villa for the select hedonists who are, without any compromise, searching for the absolute best: in location, in design, in detail. In the perfect picture! 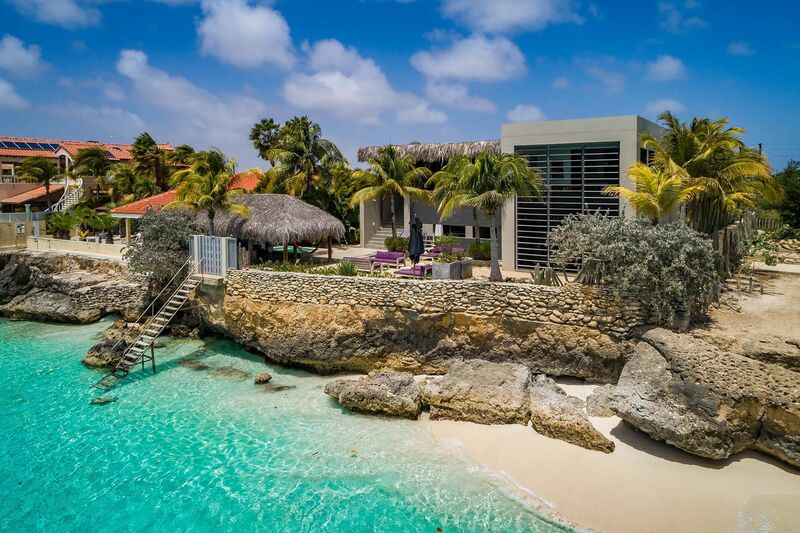 EEG Boulevard 40a is perfectly located within a few minutes drive from the center of Kralendijk, Flamingo Airport, the spectaculair blue bay of Sorobon/Jibe City, the pink salt pans, the cool Kite-beach Atlantis and the most pristine dive-site on the South-West shore of Bonaire. 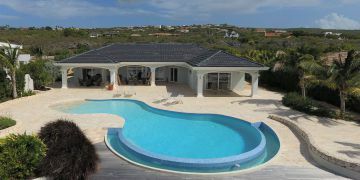 This ulitmate luxury beachvilla located at E.E.G. Boulevard 40a can only be fully appreciated during a showing, which Sunbelt Realty will gladly organize for you. You're more than welcome. Lush tropical garden with a mix of plants & trees and paved terraces and paths. Entrance into hall with stairs leading to upper floor with living room (with outdoor stairs leading to sun terrace, lounge pool and access into the Caribbean Sea), dining room, kitchen (with spacious pantry and guest half bath), guest studio (accessible using separate outdoor stairs) with kitchenette, bedroom, bathroom and covered street-side terrace. From entrance hall at lower floor access to master bedroom (access to sun terrace) with walk-in closets and en suite bathroom, two guest bedrooms (access to sun terrace) with two en suite bathrooms, separate guest half bath, storage/laundry room, door to garage. Under the outdoor stairs from the living room an additional storage closet. pool pump- and filter system (Magnesium). Registered at the Land Registry Office Kadaster, number 4-F-261 & 4-F-1059.